MegaSkills are the attitudes, the behaviors, the habits that determine achievement in school and beyond. 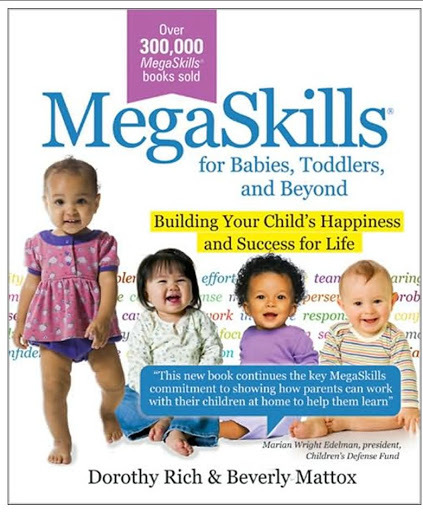 The work of the MegaSkills is to build success for children, parents, and teachers (nannies and au pairs) through books, trainings, conference presentations, and partnerships with schools and communities nationally and internationally. I love using this book as a nanny. It provides simple activities to do with children to help them develop confidence, motivation, effort, responsibility, initiative, perseverance, caring, teamwork, common sense, problem solving, focus, and respect. It is specially designed for school-aged children, this cornerstone guide provides you with hands-on techniques and kid-friendly activities to teach children the MegaSkills that are essential to success in school and life. Along with the specific activities, this guide contains academic objectives for each MegaSkill, tips for getting the best from technology, MegaSkills report cards for parents and children, research notes, and a wealth of additional resources. Dorothy Rich, Ed.D, is an acclaimed educator and expert in how families can help children succeed in school and in life. Dr. Rich is the author of MegaSkills, now in its fifth edition, which has been used by more than four thousand schools and thousands of families across the United States and abroad. She is founder and president of the nonprofit Home and School Institute, based in Washington, D.C. I recommend parents (and caregivers that work in the home) to take the following test by Dorothy Rich to measure how they are helping the children’s achievement. Click here to take the test. This is a great book idea. Your newsletter is such a source of inspiration for me. I truly love it. When I get bored your resources inspire why I am a nanny/newborn specialist again. I could never consider myself just a babysitter when using this publication as a resource. I really am the best nanny I can be. Thanks!!!! Caroline Dorriss Newborn SpecialistSan Diego Cali. This book is an outstanding addition to several self help books out there that advocates maximizing the potential of children by studying behavioral patterns and habits. By providing a baseline assessment of your child's current learning curve you can improve on the mental conditioning necessary for your child to succeed in school. I think it is high time that someone took an interest in creating a book that touches the soul of rearing and parenthood in the aspect of a secondary care provider. As much as a lot of people say that Nannies shouldn’t be considered a parental unit, there is an undeniable truth that the job entails many skills and discipline in molding and developing the holistic persona of a child which is exactly the fiduciary role of a parent. I remember encountering a similar book that talked about the unsung roles of care providers in a nuclear family and as far as the extent of their fostered relationship with the children they cared for beyond the parenting years. There are many stories about nannies maintaining close relationships with fostered children well beyond their adulthood, as nannies most often stand more to a child than just another parental or authority figure, where they try to fulfill the child’s longing and unmet expectations and this in turn fosters a closer bond.